Golfers, trap shooters and philanthropists will storm Sun Valley next week for the annual Idaho Governor's Cup, a fundraiser that helps Idaho students stay in the state for higher education. Five hundred and fifty donors are set to attend the event, the sole fundraiser for the Idaho Governor's Cup Scholarship. The fundraiser was started by former Gov. Cecil Andrus, and Gov. 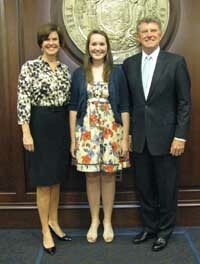 Butch Otter has used the event to help 77 Idaho students attend Idaho schools during his administration. The fundraiser centers on its longest-running and most popular event: a golfing tournament that will draw 235 competitors this year. "When Gov. Andrus started it, it was a golf event," said event director Katie Hammon. "We're kind of known [for that]." But over the years, other governors have added more activities, turning the fundraiser into a multi-faceted, multi-day event. Rep. Wendy Jaquet, D-Ketchum, said Gov. Dirk Kempthorne approached her during his administration to develop activities that might appeal to the spouses of golfers or donors who had no interest in putters or drivers. Jaquet and Sen. Michelle Stennett will lead two hikes over the weekend, while Jaquet's husband, former Ketchum City Administrator Jim Jaquet, will lead a guided Hemingway tour. Still, Jaquet said that sometimes attendees are content to just relax. "People sign up for things, and then they say, 'It's so beautiful here, I could just sit on a chair and read all day,'" she said. "And that's what they do!" The scholarship is a $3,000 award renewable for up to four years. One of this year's scholarship recipients is Wood River High School senior Kylee Richmond, who is set to attend The College of Idaho in Caldwell. Last year in Coeur d'Alene, the cup raised more than $893,000 for Idaho students attending schools such as Boise State University, University of Idaho and College of Southern Idaho. Hammon said she hopes to raise almost that much this year. "I like to be conservative, but I'd definitely like to get over $850,000," she said. "All the [scholarship] money comes from the event, so depending on the event, that determines how much money we can give." The recipients are chosen by the Governor's Cup board of directors from roughly 750 applications. Hammon said the winners are "all pretty exceptional." "Our main focus is on community service, and the amount of activities these kids are doing is just amazing," she said. Gov. Otter's spokesman, Jon Hanian, said the scholarship is an attempt to prevent the "brain drain" in Idaho. "We want to ensure we have students who at the very least begin their higher education in Idaho," he said. "We want to keep our best and brightest at home." Jaquet said she thinks the scholarship program has made a difference for a number of Idaho students, especially with the recent recession. "With rising tuition costs, you need to do anything you can to find resources for students," she said. "In the past few years, it's just helped a lot of kids. Registration begins Wednesday, Sept. 7, at noon and the event continues through Saturday, Sept. 10, at 10:30 a.m. A welcome reception will take place on Thursday, Sept. 8, at 6 p.m. on the terrace at the Sun Valley Club. The event will include a concert by country music star Lee Ann Womack at 8 p.m. on Friday, Sept. 9, at the Sun Valley Pavillion. For more information, including how to register, visit www.idahogovernorscup.com.